Workplace health and safety and environment signage. Front lift bin / walk in bins / hook lift / roll on roll off / rear lift. At Signal Waste & Recycling we take the safety of both customer, employee and the public very seriously. Signal Waste has adopted a Safe Operating Proceedure for all truck drivers that enforces safety is maintained at all times. SOP Signal vehicle operator states - At no time is the operator allowed to empty or transport over loaded bins. The customer is to ensure that there is no waste material overloading or protruding past water level of the bin. 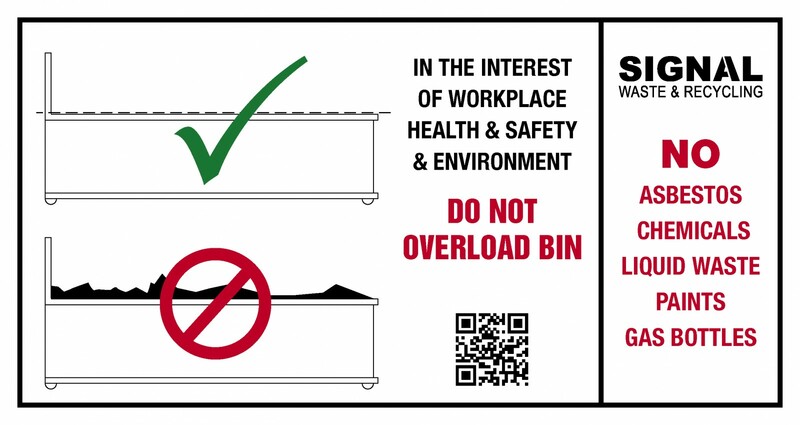 If the bin is overloaded, material may fall out during the lifting and transporting process and cause injuries or damage to the Operator, equipment or others. If the bin is overloaded it is up to the discretion of the Operator as to how they can rectify the problem or futile (leave the bin alone). If the Operator can solve the overloaded problem themselves, they can speak courteously to the customer and ask them to rectify the problem or the Operator can remove some items if it is safe to do so, provided the Operator uses correct PPE. If the Operator chooses to futile (leave the bin alone) Signal's office staff will be in contact with the customer and arrange an alternate collection day. Fill to top only signage. Front lift bins /walk in bins / hook lift / roll on roll off / rear lift. This means exactly that. Do not fill the bin past water level.